Comfort is always a good idea — especially in the cold when all I want to do is curl up in a ball next to my cute pants from Express (who is also always curled up in a ball anyway). This sweater is my current favorite from Chicwish outerwear selection (meaning on-trend, good enough quality to last, but not overly expensive). No need to say that a knitted chunky sweater is the warmest clothing item you could get. But there is something else that makes these pieces so irresistible. Chunky sweaters and any other cardigans add dimension to your look. It’s like saying “Hey I am here, look at me!” with your clothes. You would usually try to say something like this with vibrant colors and prints, but that’s not necessary with chunky garments. These big and almost fluffy wonders get all the attention just because. 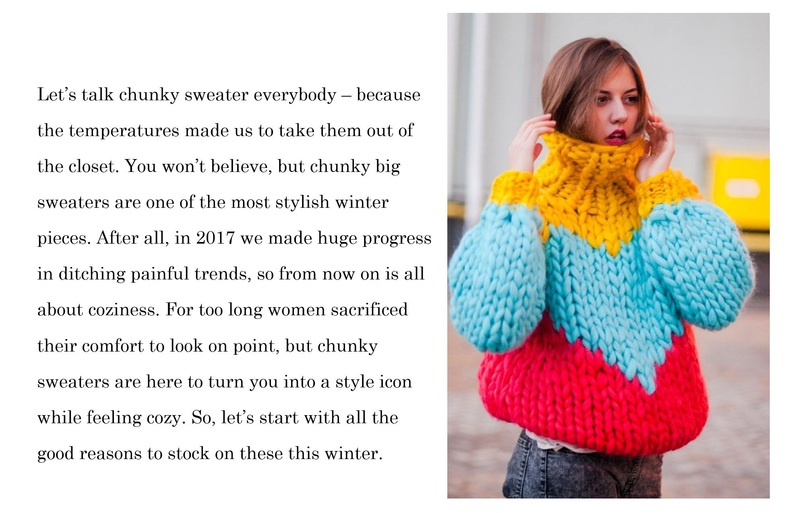 The chunky sweaters, on the other hand, look the best when combined with long pants. Go chic and mini with metallic one or keep yourself warm with a mini or maxi skirt. It’s easier to pull off these combos than you think. The moment you feel the warmth and coziness of the chunky sweater you’ll forget all your fashion fears. Don’t forget to add flare pants to your closet because this is the pant that took over the streets this season. Over sized chunky sweater on loose flare pants– you can’t get more comfortable (and stylish) than that. Don’t forget to check out Chicwish for more stylish chunky sweaters or click the link above. I am such a fan of this trend- and the way you styled it! I love how you styled yours, Len. You’re always so creative and stylish! I really love the sweater and your pants even more. Looking great. I am seriously living in comfy sweaters right now. Love Chicwish too! You styled all these sweater so great and chic, they are just in my style, love them all! The chunky sweaters are super cool and stylish. I like the red. I love how you tuck the sweater in to show off your figure. Perfect styling trick! Oh, just LOVE that sweater and the chunky knit of it. So pretty! I love a good chunky sweater. You look amazing in this outfit, Len! Chicwish always has the best sweater selection! Love them! The sweaters are super amazing and Iike it really how you have styled your sweater! Ah those sweaters are just perfect – what a great choice!! I love cozy sweaters and those are beautiful! I’ll have to have a closer look at Chicwish. 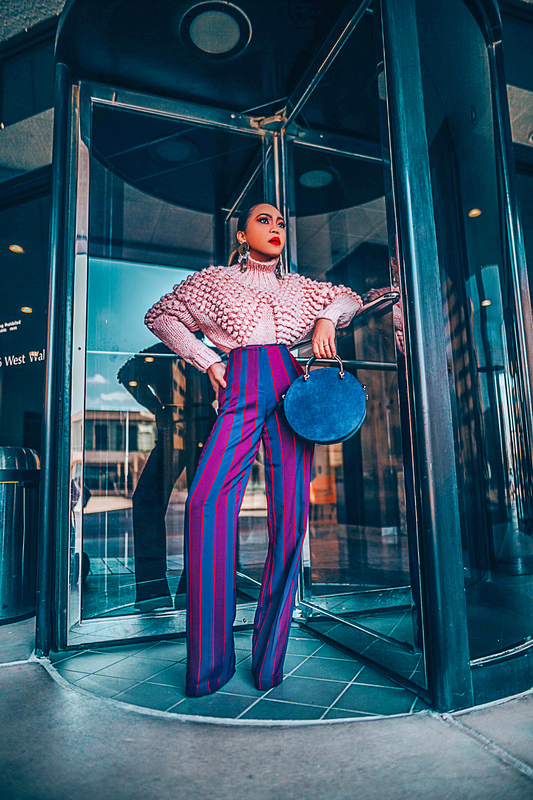 I love the bags you’ve styled too – the round bags are definitely a must-have for 2019! Ah yes I bought two this winter so far. One cropped and one with knit bauble details. Love all these looks here. I love oversized chunky sweaters! fun post! Yes to chunky sweaters! But I am definitely on board with getting one that lasts longer than a year in terms of quality, especially if you end up falling in love with it! Lovely looks dear, edgy and sophisticated, especially the red chunky sweater and white trousers. I am a big fan of comfortwear! YESSS on something that keeps you warm and comfortable, while looking stylish at the same time! I love the picks for the chunky sweaters. The combination with long pants works out well! Thanks for sharing!! Keep rocking your outfits :). so cozy! I especially like the color block one! It looks so warm! I love the way you’ve styled this sweater! 😍 Thanks for the inspiration!! I always think it’s so hard to look cute while staying warm, but I can just take a page or two out of your style book! 😀 You always look fab, Len! Yeah chunky sweater is a Thing! But sometimes I find it really difficult to style with bottoms. Your combos are really good! Loving the oversize sweater look…it’s cute and warm for this freezing weather. I’m agree… Comfort is always a good idea and I like yours outfit so much! Have a beautiful day! I’m a fan of chunky sweater. I find them so chic. You look amazing Len dear. Love all these sweaters! The first chunky blush pink one is my fav! So cute! Great post! Love the sweaters. Have a great week. I actually really love this brand. They make the cutest stuff! Chunky sweaters are my ABSOLUTE favorite now that I live in a cold climate. They’re so cozy and this post gave me great ideas about how to wear pieces I already have in my closet. I love chunky sweaters so much, and have seen so many delightful pieces. Unfortunately I am yet to find one that suits my frame. Major sad face. Also it’s summer where I live so I can’t even indulge in this yet. I’m obsessed with chunky sweaters right now. I loved all your ensembles! I love the look of flare pants with a tucked in chunky sweater! Amazing sense of style Len! Love these sweaters and how you styled them! Love every one of these sweaters! The primary stout become flushed pink one is my fav! So charming! I’m a fanatic of stout sweater. I discover them so chic. You look astonishing Len dear.